Nei Li was killed by a Sage Emperor and Reborn as his 13 year old self. This time Nei Li want to change everything, to save his loved ones and his adored Glory City. He will avenge his death and to the people who ran away and betrayed the city while being attack by monsters. With his previous life knowledge, skills and techniques that he learned in his previous life, he will teach his friends and some trusted people to save the city from the incoming massive attack of monsters that will happen according to his previous life. Though as he start as the weakest, you will find him very funny and wise as he climb the steps towards the strongest. A Guy who live a normal life was suddenly stabbed by robber. Then he suddenly found himself blind and unable to hear nor speak. He then began to realize that he was reincarnated into a slime. He discovered that he has a 2 unique ability, [Predator] an ability to learn opponent’s abilities and [Great Sage] ability that make him understand the rule and law of the universe. While slowly getting used to the life of a slime, he accidentally encounter the one of the most-feared and dangerous monster with a catastrophe-level the “Storm Dragon Verudora”, and his journey began to move. Tomokui Kanata had come to an unfortunate death and has been reborn into the weakest race, “Goblin”, a mischievous, ugly, dwarfsize creature, and given a new name, Rou. Goblin Rou still has his memories from his previous life which made him wise and clever enough to survive in this new alternate world. Then he discover his ability to gain skills, buff, and boosts from eating anything. Will Rou continue to grow and end up becoming the strongest of this world? The grand magic from Hero and Demon King’s battles cross over the worlds and exploded in the classroom of a certain school. One of the students who died has been reincarnated into a spider in a different world. A very weak species yet she surprisingly adapted and quickly learned how to live as a spider. Then she discover that she can learn new skills, buff, and boosts from eating her preys. Let’s see her adventure and how she manage to continue on living as a spider. A very misfortunate 34-year-old NEET otaku meet his end by trying to save a high schoolers from a truck at a fast speed. The next time he opened his eyes, he was reborn as Rudeus Greyrat in the world of Sword and Magic. He then started his life to the fullest and without regrets. This time will Rudeus strive to become something such as great swords man or a magician? A man who is a fan of mecha toys and mecha programing games died. He was reincarnated into another world as Ernesti Echevalier (Eru). In this world Eru was so lonely and dull. Not until he saw a huge humanoid weapon known as Silhouette Knight. The Dream of piloting those robots since he was alive from his previous life will come true! But not so fast because it requires to be a Knight and higher positions to pilot the Silhouette Knight. Since he has his previous life memories will life become easy for him? Will it be useful to him? The story follows Tang San, a man who was prodigy in martial arts and hidden weapons of all. However he steal the most secret teachings to fulfill his dreams, Tang San committed an unforgivable crime. With his dream attained he throws himself to the hell’s peak. But he was Reincarnate in another world, a world without magic, martial arts, and weapons, it’s a mysterious world where only the mystical souls of battle lay. The Great Shang dynasty has been in power for many years, but the Gods have found fault with the new emperor. Instead of submitting to their will at the expense of his people, the emperor resolves to throw off the Gods and free humanity. The fate of all humanity will be determined by this great battle between the forces of Heaven and Earth! I'm reading now TDG in novel because the manga is very slow It makes me irritate so much. My Reincarnation as a Slime is very exciting he is very powerful but I think humans too have powerful warriors..
Re:Monster is not for kids. but the story is pretty amazing I wonder what will happen to the ones that has been devoured they seems alive and even talking in darkness maybe in other dimension of his tummy. "My Reincarnation as a Slime" is so cute but I'm wondering if there will be a gender bender, because she always transform into that girl and some of characters get blushed upon seeing her cute appearance. Thanks!!! 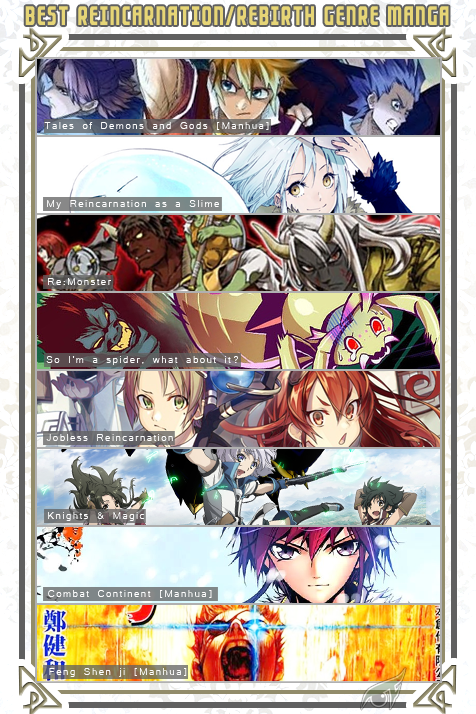 I really loved the Tales of demon and gods! I really think you should update this admin, there are many isekai now that is more fun to read. I'll update this very soon! hope you'll keep in touch..